Today would have been my Mother's and brother's birthdays. Yes, my brother was born on Mom's birthday and she always said he was the best birthday present she ever got. They always had the most visitors for their birthday because seems we used to celebrate trick-or-treat on the 30th back home. Of course that was long after I left home because when I was home we lived on a farm way up a holler and there was no trick-or-treating so I certainly could be remembering incorrectly. Anyway, we used to tease Mom about her birthday being on Halloween. Things haven't changed much. I no longer live up a holler but we live 'out' and have not had trick-or-treaters in the 32 years we have lived here. I really think we miss something there because I think it would be fun. That does not, however, stop my husband from buying candy - just in case - yea, right! And it is not the bite size bars! 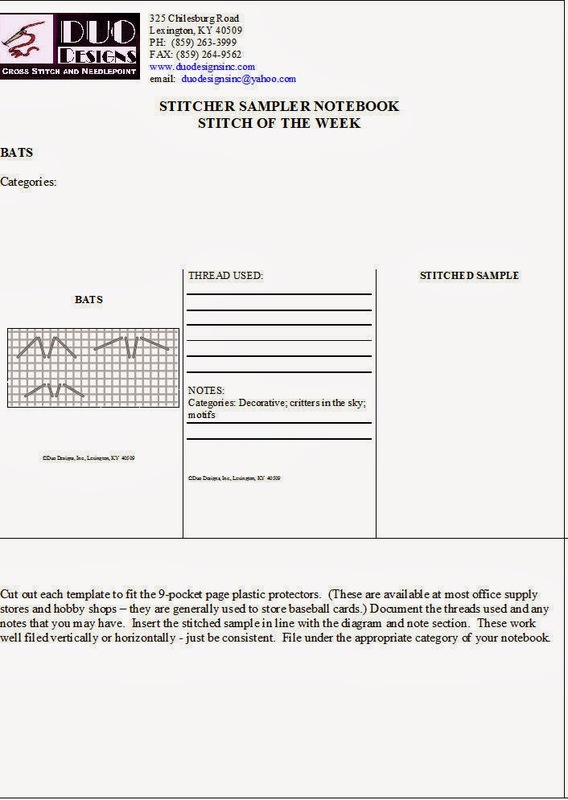 In recognition of Halloween, this week's stitch is the bat stitch. It has a Halloween flavor don't you think? You do know that bats are helpful creatures don't you? We have them in our barn and they are welcome as long as they 'keep their place' as Dad would say. I believe 'their place' was anywhere as long as it didn't bother or interfere with him- lol! These simple stitches can be used for backgrounds as bats flying in a night sky, for instance. You can expand their wings even more if you desire. They can be added as a decorative touch to clothing or motifs on items such as buckets or book covers. They are quick additions to add a statement to your design. Have fun. Until next time, stitch with a smile! For those of you fortunate enough to get to come in early, you are in for a treat. On Thursday, I have the pleasure of offering two wonderful classes. From noon until 3 pm a wonderful new designer - Pepperberry - has shared with us one of her cute snowmen - Brrr... This fun fellow just oozes with personality. 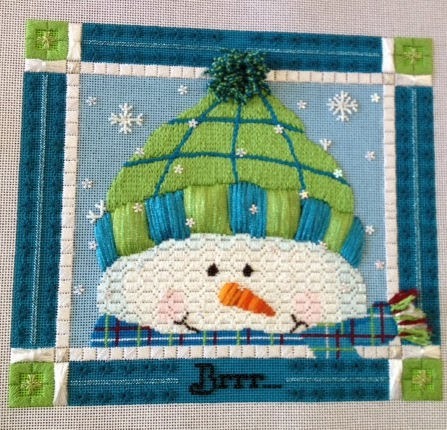 Brrr... will use great threads and embellishments provided by vendors such as Rainbow Gallery, Pepper Pot Silks, Caron, ThreadworX, Sundance, the collection, ThreadworX, DMC, Kreinik, and Colonial Needles. His sparkly face and rosy cheeks are highlighted with his cheery smile! His 'knitted' hat is keeping his snowball head warm (hmmm will he melt?). We will do some appliqué of padding with felt and stuffing to create the dimensional hat brim. And what about that wonderful twisted pompom? What fun! Don't forget his padded nose and his fringed scarf. the collection snowflake sequins are falling everywhere and Sundance hex beads build larger snowflakes in the sky. We will create borders with more bling! On Thursday evening from 3pm until 6 pm a very colorful and fun fellow known as Blossom Bay shows up and is presented by Sundance Designs. This guy has so much to offer! Stitches, threads, sequins, beads, techniques galore that we will not be able to cover them all during the time frame but we will hit the highlights! Sponsors include Sundance, Amy's Keeping Me in Stitches, Caron, Clover Designs, Kreinik, Painters Thread, DMC, Pepper Pot Silk, Vineyard Silk, River Silks, Rainbow Gallery and Colonial Needles. The first thing we will cover will be needle felting on canvas. Through the generosity of Clover Mfg. you will be using the ultimate in needle felting tools to learn how to properly outline the design area and then quickly fill in the area. You will be exposed to silk roving provided by Painters Thread and wool roving provided by Clover Mfg. so you get to experience both. We will do some silk ribbon embroidery with the beautiful River Silks ribbon. 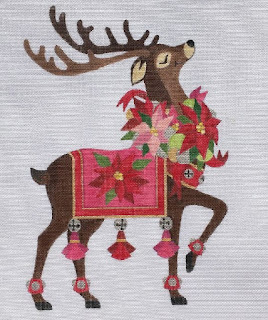 A simple way to attach sequins will be illustrated using the never-ending choices of Sundance Designs beading threads, beads and sequins. Twisted lazy daisies give the impressions of faux bullions and these are created with threads from Rainbow Galleries, Kreinik and Vineyard Silks. 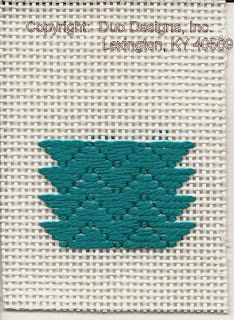 A quick demonstration of simple ruching with Kreinik will also be covered. Buttonhole stitches are made using many silks, RibbonFloss Shimmer and the traditional DMC pearl cotton. So as you can see, there is lots to cover in a short amount of time. Friday is a full day with a wonderful Halloween piece designed and sponsored by Leigh Designs. Listeners is from the Familiars Series. Oh gosh, where do we begin. We have so many wonderful sponsors again. 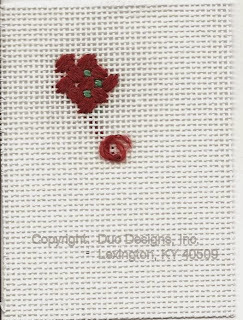 Leigh Designs, Clover, Colonial Needle, Rainbow Gallery, Kreinik, Painters Thread, Pepper Pot Silk, River Silks, Needlepointer, Amy's Keeping Me in Stitches, Gone Stitchin' and Vineyard Silk. 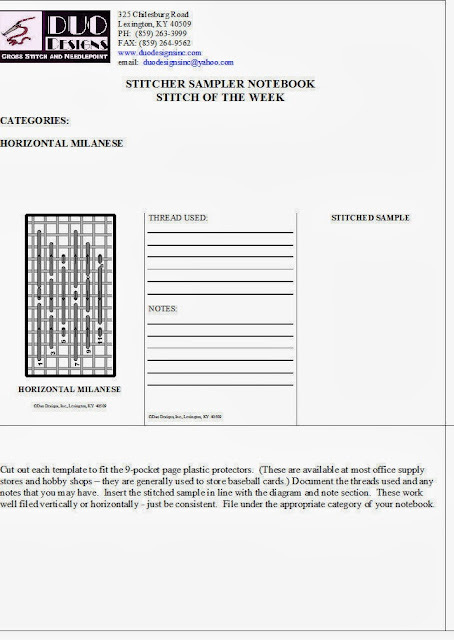 We must stitch the fence first since it is white and the black fuzzies will interfere otherwise. 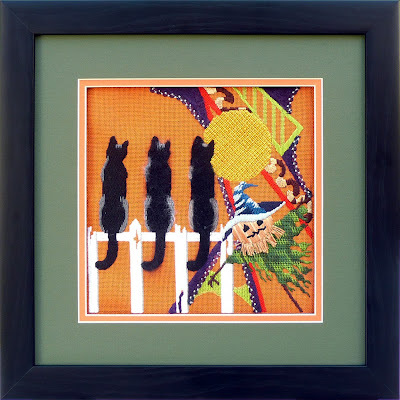 Next after the fence is we will needle felt the cat on the right by incorporating different colors of roving. We will be using wonderful Clover Mfg. needle felting tools. Then we will be experiencing different threads for the other two cats. We will play with options for the moon. One option will be to fill the moon with battlement couching. We will have a choice of an alternate filling also. See that little scarecrow? Well, we are going to be stitching him with Silken Straw! What a joy. Saturday morning is going to be so much fun with Red Hot Momma sponsored by A Collection of Designs. Those of you who know me know that I just plain ole have fun stitching the pieces I do and I believe it shows. Janet told me that I could be as 'trashy' as I wanted with this gal and I did not hold back. But I told her when I finished her that any gal who wore Swarovski crystals should not be classified as trashy so therefore I considered her classy. Sponsors include A Collection of Designs, the collection, Rainbow Gallery, Kreinik, Painters Thread, Pepper Pot Silk, Sundance Designs, Colonial Needle and ThreadworX. A Collection of Designs Canvas No. 3055 works up rather quickly. There are also two other companion pieces at this time. The collection Swarovski crystals add a wonderful bling to this design. Accents include Sundance beads that are added with matching Sundance beading threads. ThreadworX specialty threads give that special touch to the hat. Vineyard Silks and Clover Mfg. Her feathers and wings are filled with a plethora of stitches,techniques and embellishments. She, too, has Swarovski bling. And she has a wonderful needle felted hat through the wonder of working with the Clover Mfg. needle felting tools. So as you can see I will be very busy at market and I hope to see you in many of my classes! I will have so much fun and hope you do too! Yep, today is Wednesday and I remembered! I am home and it is a crisp morning (that's an artistic word for cold) . Getting ready to revitalize the fire left over from the fire in the fireplace last night. I love my fireplace and I love my husband for his continual work year round to make sure I have an ample supply of firewood. Well, I love him for other reasons too, but right now, I love him for making sure I have firewood! 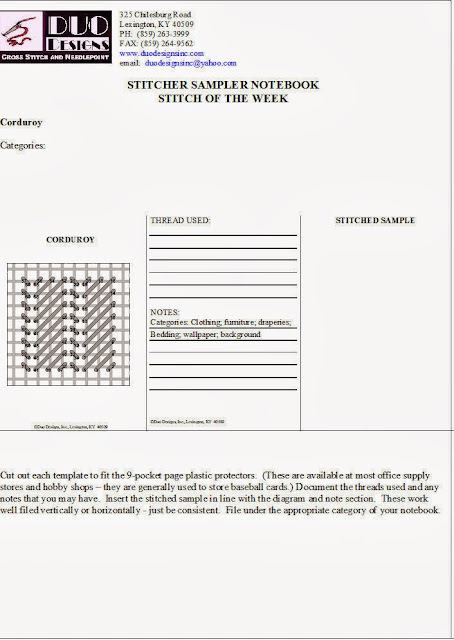 Today's stitch is the corduroy stitch. Okay, I have a confession to make. When I think of this stitch I have a difficult time getting beyond the category of clothing. To me corduroy is clothing. Period. The stitch can be used for much more than that, of course, but I must think to get beyond that and that means I must work. And, as I told you guys in the beginning, I am willing to share my stitches with you but I sure don't want to work in this process! That's what I do for a living. Speaking of which, I do have models to finish for the TNNA market because I want to share them with you this week. I am so excited about the stitched versions and I want you all to be in my classes! They are such fun and I never saw so much 'stuff' the vendors are providing to bring these canvases to life! Threads and felting tools and beads and sequins and, and, and, and. So off to the fireplace and my stitching. 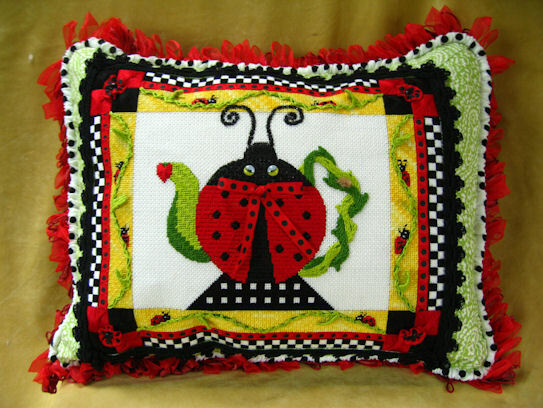 Enjoy your stitching and smile while doing so - in other words - stitch with a smile! Yea! It is Wednesday and I remembered! Believe me, that is becoming quite a feat! We are having such glorious weather here in my part of Central Kentucky. I am afraid that it will not last however, and it won't be long before it will start to get colder and colder and grayer and grayer. I do, however, have my wonderful fire place and a barn full of firewood that my husband laboriously works to stock up for me each year. If a tree falls, he hears it - sometimes he helps it! Today I share with you the Ridge Stitch. 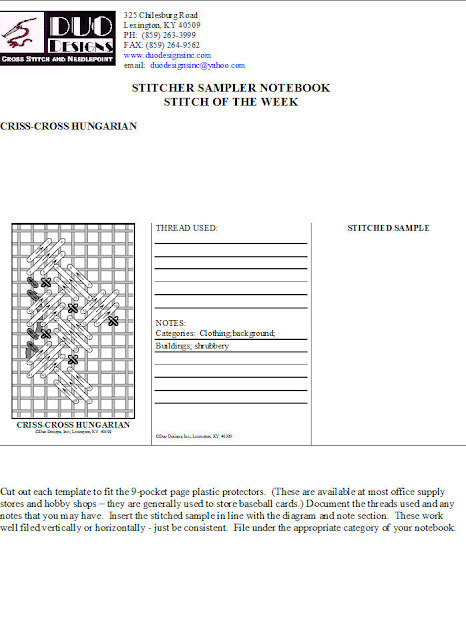 This is an oblong cross stitch that lays diagonally. 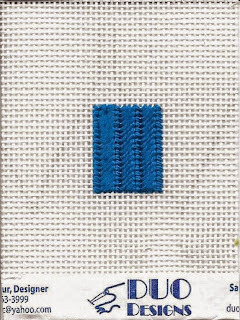 I also stitched it diagonally. The stitch presents a nice fill. It also can create nice vertical lines if you should choose to skip every other row and fill that area with something else. You can see the rows better in the orange version. See how you can leave out the center row? Have fun with the stitch. Please share your progress with others. 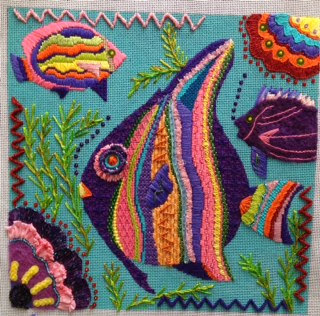 We love to see how you are doing and what you choose to do with your stitches. That is how we all learn. 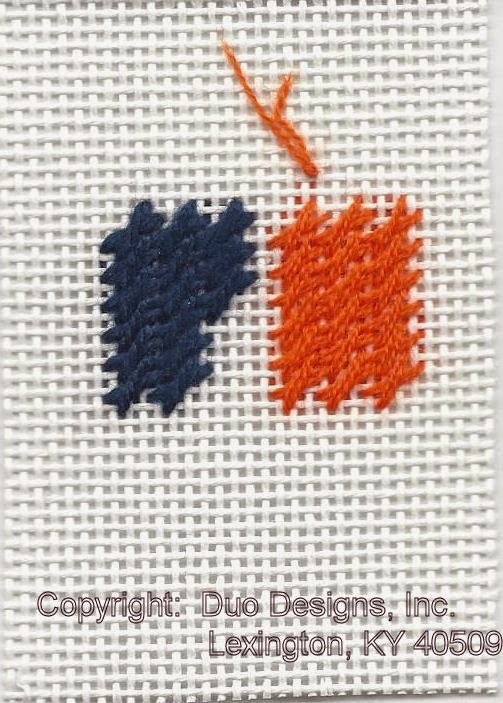 Remember to stitch with a smile - even when you reverse stitch (also know as rip it!). Smiling makes it go better - at least I try to convince myself it does - LOL. Okay, so it isn't October 9, it is October 12. 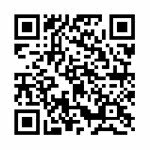 I was so involved in the EGA Seminar in classes, visiting teachers, looking over all the wonderful upcoming classes, etc., that I did it! I let Wednesday just slip right on by without a thought! I truly apologize. BUT, I did warn you from day one that this would happen from time to time. This is another learning phase for me. I am trying to figure out how to move my docs from my PC to the Mac. I have the pics you see in this blog set up as jpgs. However, when I save them out there in outer space so that I can use them here, they appear to have a grey and blurred background. So, I'm not sure what you will be able to retrieve here. I think they might be a little better on the Yahoo Group. Sorry, but I'm still struggling. On this one, you will need to jot down the categories. Maybe I'm getting lazy or maybe you are getting too dependent! 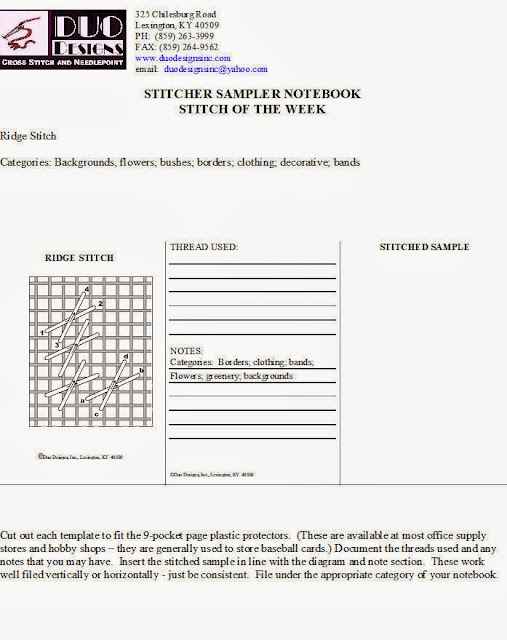 This is wonderful stitched horizontally (just turn diagram) or vertically. 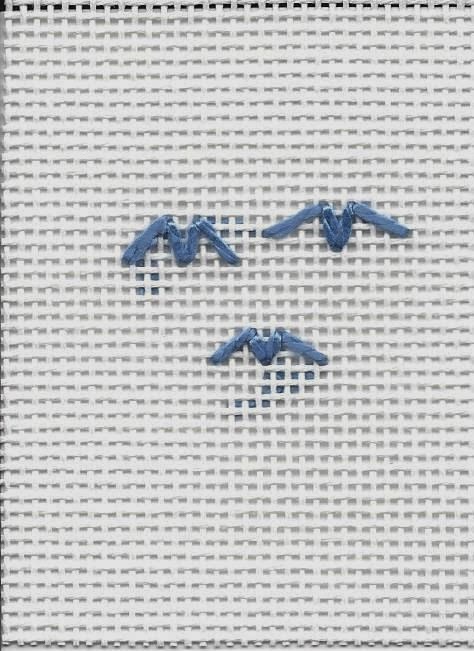 My stitched sample shows horizontally - and - surprisingly - I think this would make a good water or sky background when stitched with a lighter weight thread. How about a roof? Wallpaper? Building? Mountain? Skirt? Santa bag? How about any place that has enough room to hold it? 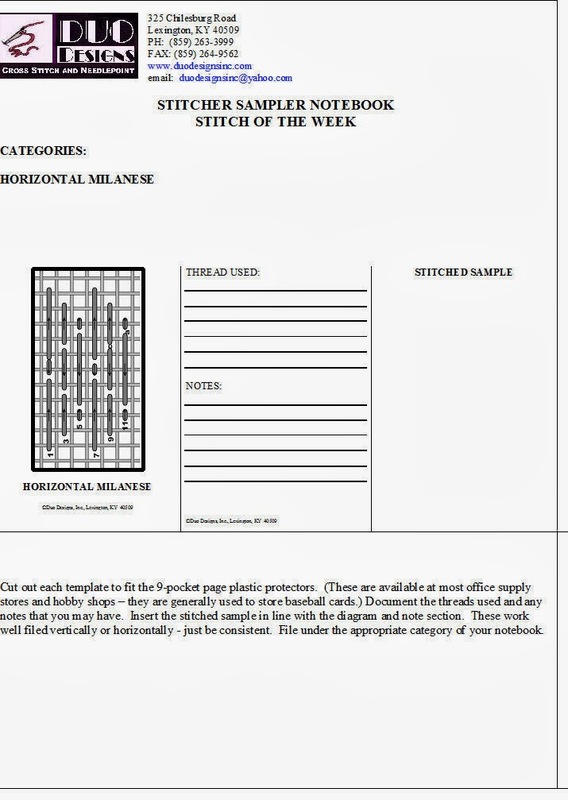 Seems to me that the area size would just about be the only real restriction for this stitch. Okay, gotta go play while I can. Seminar is already half over! Yikes! Have a great week and Stitch with a Smile! 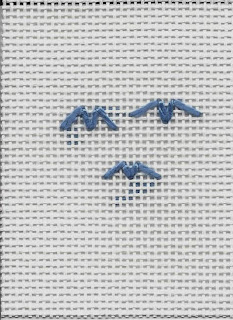 The Stitching Studio and Gift Boutique in Richmond, VA, who is sponsoring the Abbey Club, will release the second kit soon. 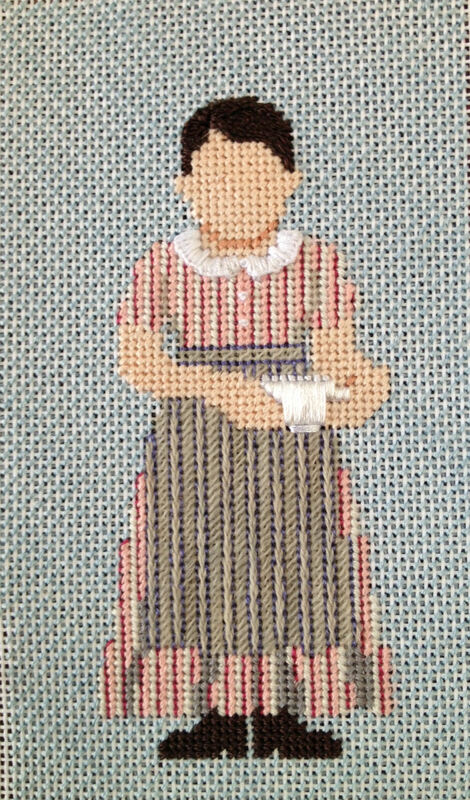 This piece is the Scullery Maid. 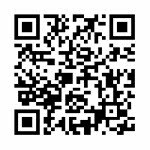 Contact them with any questions about participating in the club and they will be happy to provide you with all the details. PH: 804-269-0355. I understand there was a little hiccup with the first mailing of the Dowager, but all is well and moving along. And, the club keeps growing and growing! Isn't that wonderful? You want to share with your friends that they must be a member of the club in order to participate in the extra character that is wearing those wonderful harem pants! More on her later. 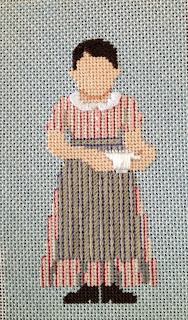 Well, in the meanwhile, here goes character number 2 - the Scullery Maid. How could any soul be any more plain and unpretentious? This young lady, while a colorful character, has no color or frills in her life. The first six (6) pieces are fun to do and work up very quickly, so get ready to get those needles flying because character 3 will be on the way before we know it. Right now I am fighting internet issues! A big truck came through and destroyed our lines and we have been without regular phone service/internet since last Thurs. Thank goodness for the hotspot. Right now I am concentrating on starting to pack for the EGA Seminar. It is in Louisville this year, which is just down the road about an hour and a half. I'll leave Sunday. 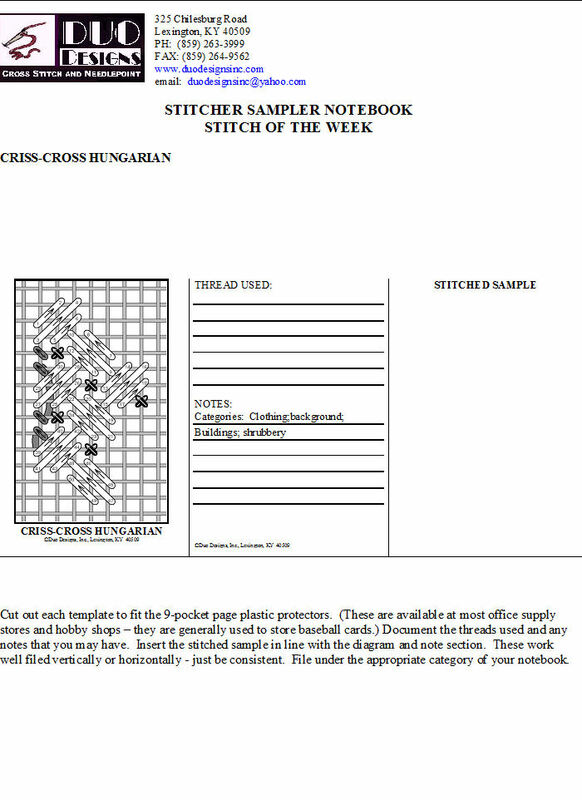 Today I'm sharing the Criss-Cross Hungarian stitch. The diagram also shows a filler of a cross stitch. 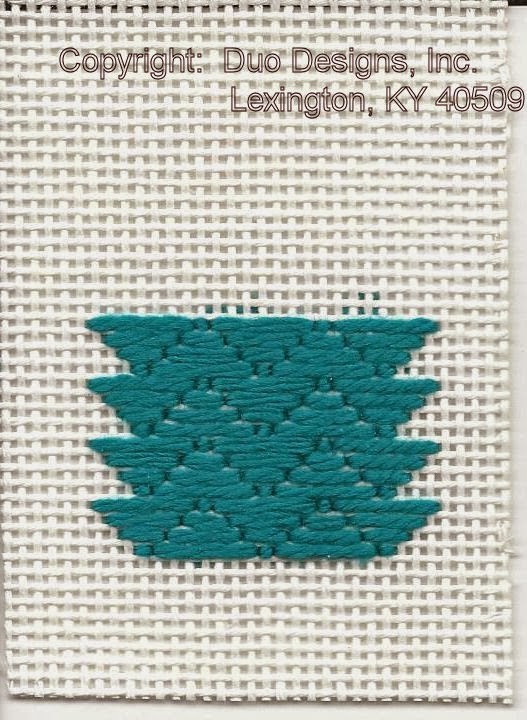 You could change thread for this stitch and make it a metallic, different color, or other texture. This also could just as easily be a bead. Enjoy your week and if you are at EGA Seminar and see me , introduce yourself!